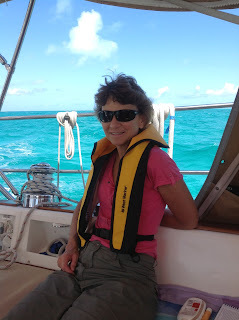 You might ask what I recall of the passage to Turks and Caicos. It’s kind of kaleidoscoped together, but here are my lasting impressions. Firstly, a passage is a time of contrast: Incredible highs and frightening lows. Action and boredom. Uncertainty and confidence…. All these things juxtaposed. The passage weather was not ideal. At times we returned to the washing machine, and once you’ve started, you’ve few options but to get through it. On occasions, no wind at all, and all was calm. No ships or other vessels in sight during the day, then at night all hell seems to break loose and every possible ship in the known world seems to be vectoring in to your current position, creating all kinds of angst. Let me tell you, AIS is the answer. We named ours "Herald", as it announced imminent calamity with precision and a frequency we would rather have done without. On the subject of names, let me tell you about "Hercules". Hercules is our autopilot, as he does all the heavy lifting. Life without Hercules is impossible. Every day, we need to talk lovingly to Hercules and tell him how important he is ion our lives – something we can do without exaggerating one bit! Two other incidents worth mentioning. 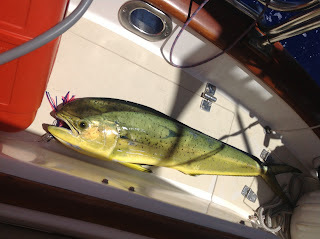 Firstly, spy out this lovely Mahi-Mahi, or Dorado as he may be known. I can personally attest to his bulky weight of around 30 lbs, as I landed said sucker myself. What a meal that evening. Freshly cooked, large filets, yum!! ...Must have weighed 30 - no wait! 60 pounds! The second incident is less encouraging. 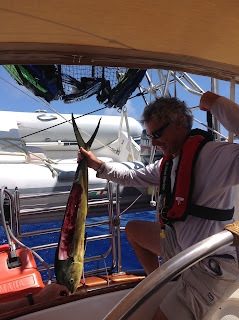 We made fairly good time on our passage, and as luck would have it, arrived at our destination around 10:00pm. This area is tricky, and you do not want to be negotiating these reefs is the dark. Did I mention there was no moon? Perhaps I should also mention the wind was HOWLING. Well in excess of 25 knots. We tried to shelter by motoring up and down close to a windward reef, but the shelter we received was marginal at best. The boat was bucking everywhere, and all crew started to turn green and mutiny. Now, mutiny is a serious thing. One needs serious measures to get one’s mind off the mutiny, so to oblige, the engine died. That did the trick – no more thoughts of mutiny, rather more sheer terror, with the classic Kingon thought (star Trek, anyone?) “Today is a good day to die!” OK. Did I mention there was a reef? And it was pitch black? And that the wind was howling? And that the waves were confused and objectionable? Well, as this epistle testifies, we survived in, but with a new respect for the sea and those that brave it’s wrath. Ultimately managed to get Thor back on line (Yes, Thor is our engine, and he was very demanding: he demanded a change of RACOR diesel filters before he would work again, no easy feat in bucking seas at 0-so Dark and Early) and as the day broke we could finally access the shallow water channel from West Caicos in to the marina.